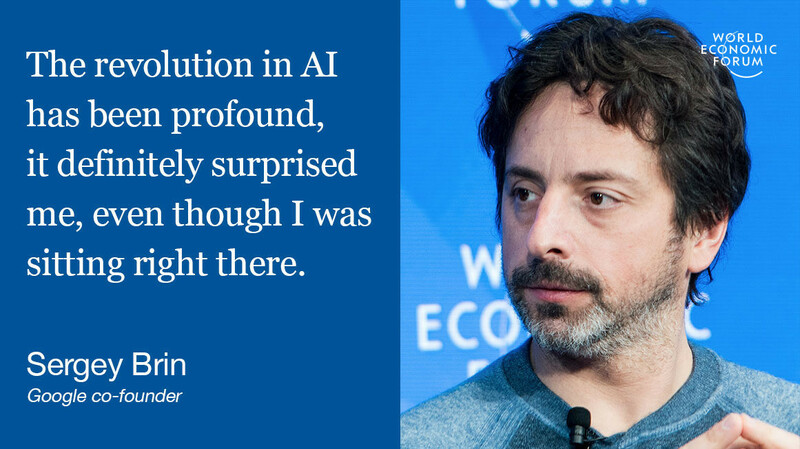 Sergey Brin, the co-founder of Google and one of the most successful Silicon Valley entrepreneurs, says he did not foresee the artificial intelligence revolution that has transformed the tech industry. Fast-forward a few years and Google Brain, the company’s AI research project, has advanced so much that it now, as Brin put it, “touches every single one of our main projects, ranging from search to photos to ads … everything we do. Now that AI is here to stay, its future and potential uses have become even more difficult to predict. In Davos for the first time in eight years, Brin also said that he’s shocked by the level of ambition surrounding the possibilities of where machine learning could take us. “I feel like the Luddite in the room,” he said. AI is the natural continuation of the industrialization of the past 200 years, Brin added, but what does this mean for education, skills and employment? This is also difficult to predict. “I would hope that, as some of the more mundane tasks are alleviated through technology, that people will find more and more creative and meaningful ways to spend their time,” Brin said. A major part of Google’s success came from Silicon Valley’s willingness to accept failure, Brin added. Finally, Brin said that anyone starting out as a young leader or entrepreneur should focus more on having fun than making money.